Kabuki Models is showing off more preview artwork for their Lovecraft Nightmares campaign they're working on. Go check it out. Hello fellow cultists! Today I am very pleased to share with you a sneak peak of Lovecraft Nightmares Invocations! While this entire Kick Starter campaign has been fun, creative, and completely immersive I must confess that the Invocations have held a particularly close place to my heart. 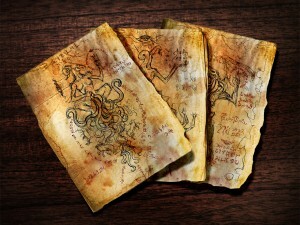 As mentioned before the idea itself of summoning scrolls is just a fantastic idea. But to actually see them come to life step by step is an incredibly rewarding experience.